Moist meatloaf with crisp bacon and pockets of swiss cheese. 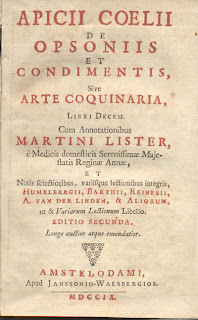 A page from a Dutch 1709 Apicius. Meatloaf is a much maligned dish. It often is thought of as a dish for those that cannot afford a real roast, or a tasteless 1950s throwback. This is a pity, because this cousin of meatballs can be flavoured with the most amazing herbs, spices and other items to make it the star of very flavourful meals. 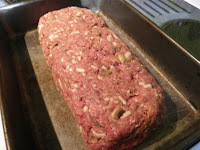 You can also dramatically change the consistency of meatloaf by the amount of "kneading" you do to the hamburger. More kneading renders a more even consistency. I have two favourite meatloaf recipes in addition to this one. In the first the bottom of the pan is covered in hot salsa; in the other about 1 cup of brown sugar is sprinkled into the bottom of the pan. When the meat is placed on top and baked the juices mingle with what’s placed on the bottom and it bubbles up through the meat. Absolutely delicious. Dried fruits can be added to meatloaf mixture to add unexpected flavours, as can crumbled bacon and swiss cheese as in this recipe. Meatloaf has a long heritage. 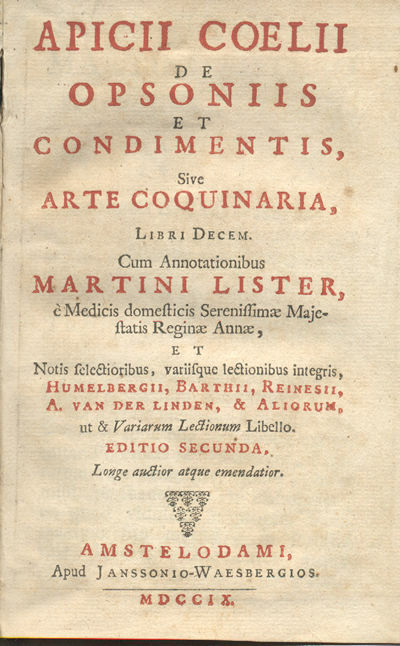 In The Roman Cookery of Apicius he outlines several recipes for “forcemeats” and sausages which come close to what we would consider meatloaf today. As you can imagine, because of the scope of the Roman Empire, every European nation has variations of ground meat dishes in their repertoires. One ground meat recipe that I have made before and will probably post in the future is the Prussian Königsberger Klopse. 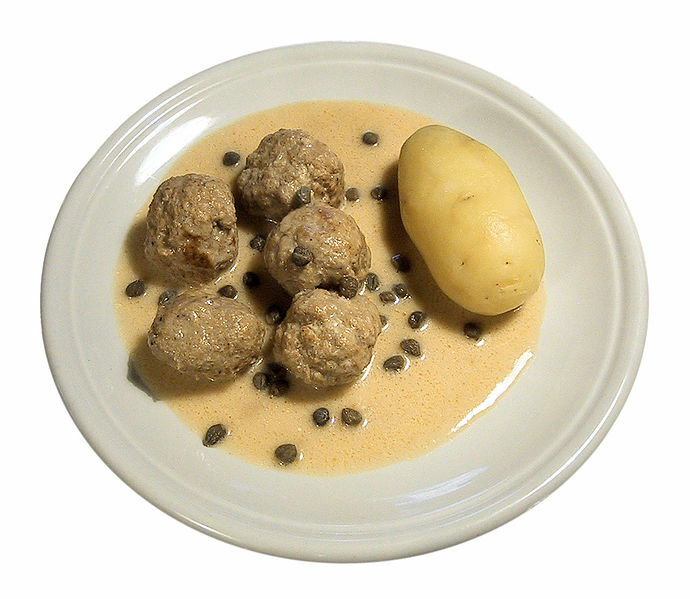 This variation has meat balls that are smothered in a white sauce flavoured with capers and sometimes lemon. 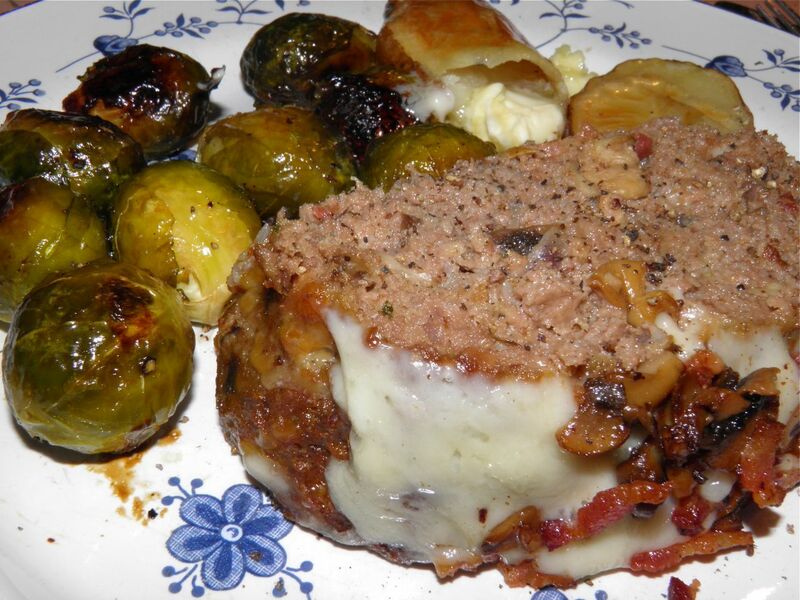 Meatloaf is often a dish that is craved on cool Autumn nights. It seemed for a while this last summer that it actually was Fall, so I guess that’s the reason I wanted to make it. It didn’t hurt that hamburger was on sale either. Since the oven is on anyway, roast some of your favourite vegetables while the meatloaf is cooking. It’s kind of the same as a one pot meal then, isn’t it? A nice variation would be to make individual small meatloaves like the Italians often do so each person gets their own uncut serving. Of course, baking time will be reduced somewhat. Just a note: there's nothing low fat about this recipe. It's pure comfort food. Shape it as though it was in a loaf pan. 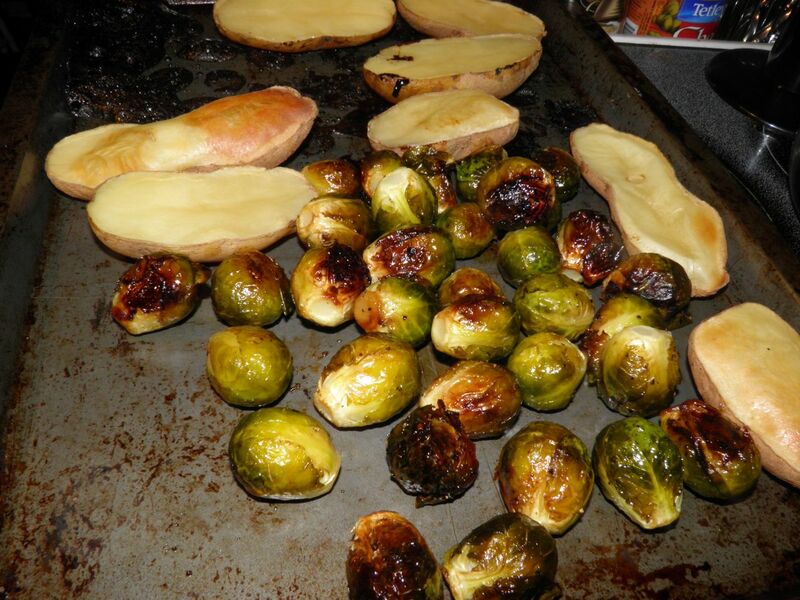 Side dishes: Roasted maple brussels sprouts and roasted potatoes for 6. The loaf just before melting the cheese. Fry the bacon in a skillet over medium heat until brown. Reserve 1/4 cup in a small dish. Place the remaining bacon in a bowl big enough to mix the meatloaf in. There will probably be a lot of fat. That’s OK.
Add the onions to the fat and cook until browned but not burnt. You’re essentially shallow frying the onions. Lift out with a slotted spoon and add to the bacon in the bowl. Pour off all the oil except fo 1/4 cup. Then add the mushrooms to the pan and cook until they are browned. Reserve 1/4 cup and put it with the reserved bacon. This will be your topping for the end of the cooking time. Add the rest to the mixing bowl. Add the beef, egg, milk, bread crumbs, maple syrup and spices to the bowl. Mix slightly and then add 3/4 of the grated cheese. Mix again. Shape into a rectangular freeform loaf in the centre of a 9x13 baking dish. The shape and size should be about the same as if you were using a loaf pan. This will give the loaf a nicer exterior crust and table presentation. Make sure you have a flat top to hold the extra cheese, bacon and mushrooms. as the meatloaf for a complete meal. Wash and quarter the potatoes. Combine 1 tbsp each of olive oil and maple syrup. Toss with the whole brussels sprouts and sprinkle with salt. Arrange on a baking pan and set aside. Place the meatloaf in the oven as well as the potatoes. Bake for 1 hour or until the internal temperature reads 170°F. Halfway through put in the brussels sprouts. They only take 1/2 hour to roast. At the end of the hour remove the potatoes and brussels sprouts and keep warm. 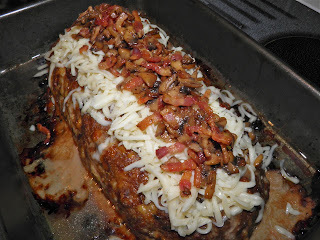 Drain off any excess fat from the meatloaf and sprinkle the flat top with the remaining cheese and bacon. Return to oven, and bake about 5 minutes until cheese is melted. Remove to a serving platter and let sit for a few minutes. Arrange the potatoes and brussels sprouts around the meatloaf and bring it all to the table. If you like this post retweet it using the link at top right or share using any of the links below.